Different honeys vary in colour and taste. For instance, Yellowbox honey has a pale straw colour with a smooth, mellow flavour and is the most popular table honey. By comparison, Messmate Stringybark honey is dark, almost molasses like in colour with a very strong flavour. It is thought that the darker the honey the greater the anti-bacterial qualities of the honey. The reason that supermarket honey looks and tastes the same is due to it being blended so as to achieve this uniformity. Consumers should be aware that much of the honey sold in supermarkets may be blended with some Australian honey and imported honey from China. China does not have the stringent agricultural regulations that Australia has and honey from there is more than likely to contain antibiotics. Some products are packaged as Certified Organic which means that the provenance of the honey is unknown and the packers (ie. the company selling the honey) have bought in honey from different beekeepers and simply blended and packed the honey for sale. All our honey is extracted at Upper Beaconsfield in our Food Registered Honey House. The varieties of eucalyptus tree include Yellow, Grey and Long Leaf Box, Red and Yellow Gum. Nectar can also be collected from Red, Brown or Messmate Stringybark trees. 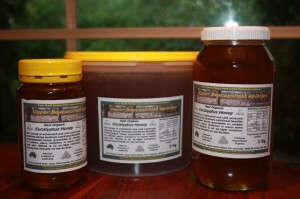 Organic Eucalyptus Honey currently available (online/mail orders only. All honey sent via mail is in glass jars except the 3kg buckets which are rigid plastic). Please Contact Us if you have any questions about any product or service mentioned in this website – we’re always happy to talk about bees, honey, organic honey and the processes involved! PLEASE NOTE THAT HONEY SALES AT OUR HONEY FARM IS BY APPOINTMENT ONLY! SO PLEASE RING FIRST IF YOU WISH TO COME TO OUR HONEYHOUSE TO BUY HONEY.